Can a viral infection aid in getting a Gout attack? Stopping Gout Together › Forums › Help My Gout! The Gout Forum › Can a viral infection aid in getting a Gout attack? This topic contains 3 replies, has 4 voices, and was last updated by nobody 8 months ago. I have had 3 gout attacks in my life, I’m 34yo male in great shape. First one was about 6 years ago, random middle of the night toe, then a year later I stubbed same toe and had a terrible gout attack that lasted 2 weeks due to that. Most recent one is this week. I got viral pharyngitis last week which was kind of a medium-flu–I was pretty sick. I went out of town the following weekend still at only about 75% health so my immune system was down. I probably drank too much, played golf, went surfing, kind of went all out. I remained coughing a lot and the last day my virus went full laryngitis and even 6 days later today I don’t have a voice. So definitely overdid it. Monday started feeling a tingling in my toe and my left knee, I knew it was gout. Tuesday my left knee was in a lot of pain. I started drinking water and doing apple cider vinegar. Woke up in the middle of the night and my toe was killing me, woke up the next morning and the knee was almost 100% and the toe was in serious pain. Today Thursday, the foot is probably down to about 50% if yesterday was 100%, so the constant water and ACV is definitely working. Anyway my big question is whether having a low immune system and being sick has something to do with why I got an attack? I’m sure it could have been over-drinking, but I have overdrank many times in the last 5 years and never had an attack, so I have to assume the sickness I had had something to do with it?? 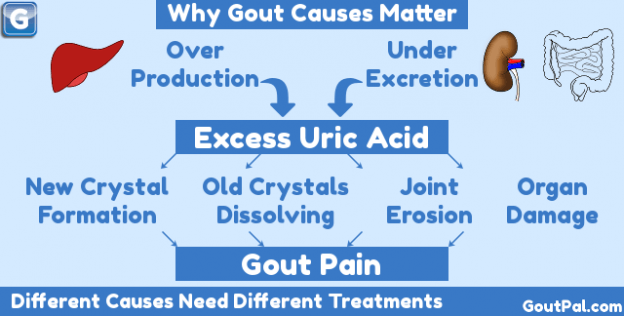 There’s really only one thing that causes gout, and that’s excess uric acid. Now, it usually takes many years for the excess uric acid to form enough crystals to start gout. So, it’s useful to have some uric acid test result history. Therefore, can you check with your doctor. Then post as much uric acid blood test history as you can get, with dates. Unfortunately, it’s very difficult to pin down a specific thing that finally pushes your gout to flare up. Also, it’s not very helpful. Because the only way to control gout, is to control uric acid. More importantly, if you do nothing, this is going to get worse. Because, you will find that interval between gout flares gets shorter. Also, more and more joints become affected. Finally, the good news is, gout is very easy to manage, if you do it right. Also, you are young enough to stop gout before it permanently damages your joints. So, to avoid that, and other potential dangers including kidney disease and heart disease, let’s get your gout under control now. If you need any help about what to ask your doctor, or how to understand his advice, please ask. I have a finger gout for 4 years and pain attack is on and off and this week I notice it has pus inside. After 2 days I consult the orthopaedic and got surgery to pop out the pus and have medication for 1 week,everyday antibiotic through injection and oral for 5 days,after I saw my finger not really healed still little swollen and there is blueish around the wound. I want to know about this condition because I feel tingkling pain in my finger. Infections should to be dealt with separately from gout. Gout is a slow disease which is dealt with by lowering the amount of uric acid in one’s body. How much uric acid is there in your blood (it’s a routine test)? Infections on the other hand need to be treated seriously and without delay. If your antibiotic isn’t doing its job, you might require a different antibiotic. Or you might have a health condition which complicates healing after surgeries. Either way, you need to see a doctor.